Reduce the time it takes to track your Certified Mailpieces by 80%. 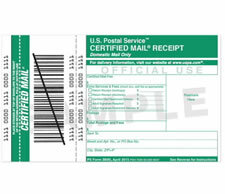 Saves $1.20 in postage on each Certified Mailpiece you prepare using Electronic Return Receipt to obtain a Digital Signature. Contact us to purchase your forms.